Last week, I spoke about electronically heated outdoor cat houses, and while I was doing some digging for that post, I realized that even if I was still living in Canada, where winters obviously get well below freezing, chances are high I’d opt for insulated outdoor cat shelters to keep stray and feral cats in my neighbourhood warm rather than electronically heated ones. Yes, the electronically heated cat houses are no doubt much warmer, and I’d want to use them if I could, but the issue I’m sure I’d run into pretty quick is related to location. Electronically heated pet houses need to be be plugged in. Yes, I know this is obvious, but in most of the houses I’ve lived in, there are no outlets randomly located at the back of a long garden. If you’re going to plug in an electronically heated cat house, you’re probably going to have to keep that pet house pretty close to your own brick and mortar home, unless you’re happy to run a really long extension chord or two all the way to the very back of your yard to make sure the heated cat house can be placed a long way away. Since so many of the stray and feral cats I’ve met in the past (including the one I adopted, and the one I got my brother to adopt! ), have been flighty and haven’t been big fans of staying close to a human house for long, I’d imagine a pet house for feral cats in winter would be much more frequently used if it happened to be placed at the very back of a garden. A secluded, quiet corner under some trees and with some bushes surrounding it would be perfect. In a spot far from human commotion, stray and feral cats who need it to keep warm would feel safe enough to stick around for as long a time as they needed. Now, if I had outdoor cats as pets rather than indoor-only ones, I’d definitely be interested in grabbing electronically heated outdoor cat houses for them, but that’s because if a cat is my own, sticking close to home would feel just as safe (if not safer) than further away hidden amongst the treeline at the very back of my yard. Let me know in the comments what your own thoughts are about this, as I’d really like to know if you agree or disagree. When do you think it might be useful to have insulated cat houses versus ones that are electronically heated? 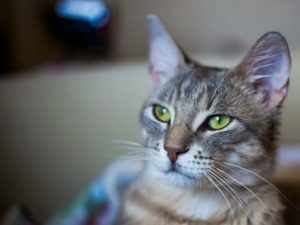 Besides whether you’re sheltering stray and feral cats in your area, or outdoor cats that belong to you or others on your street, I think the other thing that’s highly relevant is the type of climate you live in, so do let me know what your winters are typically like in your comment. Now that I’m living near Lisbon in Portugal, I would 100% get insulated over heated, because winters here just aren’t so cold. I actually find it’d be more important for me to have weatherproof/waterproof cat houses than for me to have well insulated ones, because it’s terribly wet and rainy during winters here, and we get bursts of rain out of nowhere that cats can easily be caught up in by accident. 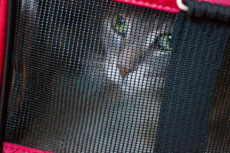 If a cat tried to hide in an insulated cat shelter I bought that wasn’t the best at keeping out rain, he or she may end up completely drenched – which would be terrible. But based on my experience living in the south of the UK for a couple of years, I probably would’ve been okay getting a slightly less weatherproof cat house and would’ve opted for an insulated one instead. The explanation for why comes down to the fact that – even though it was wet and rainy – it didn’t typically pour buckets. Bournemouth definitely didn’t have the aggressive wind + heavy rain combo I seem to be getting a lot of here. It also got reasonably colder in the UK than it does where I live now. I first discovered the Kitty Tube when I did up my article about outdoor cat houses so pretty I would happily use them inside. Even then, I mentioned how the Kitty Tube would likely be my first option for sheltering stray and feral cats in my neighbourhood. Roomy, insulated with straw, extremely easy to clean, and visually appearing to be quite weatherproof and well designed, it’s one of those products I find it hard to imagine improving on. Lots of people seem to have success with using them for stray and feral cats in their neighbourhood, though if you try it out and find the cats won’t take a gander in, you may want to try what this reviewer did: start with the top off, treats inside, and sprinkled with catnip (amongst many other good tips). Need even more insulation? Kitty Tube now has a version of their Gen 3 cat house that’s got a double insulated liner – I think it’d be hard to find a warmer insulated cat house than that. 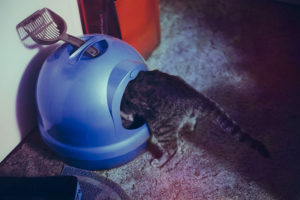 If you’re looking for a lightweight, insulated cat house that’s easy to move from one spot to the next, this is probably a lot better for you than the last option, and certainly many other options on this list. Lots of glowing reviews on this product and it’s heated alternative. And just in case you’re wondering how it can possibly be well insulated with such gaping doors – there are removable plastic door flaps that come with it to help keep the warmth in during cold winter months. I feel like Petmate’s Precision Pet Extreme Log Cabin is one of the most gorgeous pet homes I’ve ever laid eyes on period. The fact that Petmate makes an insulation kit for this exact model is just amazing to me, and I definitely think I’d find it hard to resist grabbing it instead of the Kitty Tube based on aesthetics alone. I’m not quite sure which would be warmer? Out of box I think the Kitty Tube would probably win, but I think with the insulation kit and some bedding and a door flap installed, it would probably be hard to beat as an incredibly warm insulated cat shelter. Which do you think would win? Another ridiculously good option offered by Petmate. Their Igloo style outdoor cat house is already insulated, but if you want to make things a little warmer, say if you grab it but kitty doesn’t find it quite as warm as he or she likes, you can buy a floor pad, a plastic door flap, and even a K&H floor heater that fits the exact proportions. So many glowing reviews from happy pet parents on this one as well. I’d imagine that due to it’s shape, it’s likely to be quite good in both rain and snow, and while I’m sure any cat would be happier to be inside the house at sub-zero temperatures, for feral and stray cats, or if the temperature just happens to drop below freezing when you’re out of the house and you don’t have a cat flap, it should do absolute wonders for keeping a kitty warm. 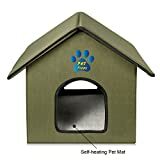 K&H Pet Products Outdoor Kitty House Extra-Wide (unheated) Olive/Black 26.5" x 15.5" x 21.5"
I’m not quite sure how well insulated this particular cat house is. A lot of pet owners seem to be happy with the purchase, but there are a few who report it not being the best when it comes to being weatherproof, and some feel it’s not quite as insulated as it should be. In terms of a basic insulated cat house that you can then add blankets and even another cat bed inside of, I think it’s pretty reasonable. Definitely a good idea, in my opinion, to keep it in a place that typically doesn’t get hit by very much precipitation. Comes with plastic door flaps to help keep heat in, and is roomy enough for, I’d imagine, at least two or three cats. I definitely don’t think it’s perfect, but do some digging in the reviews to see if it will be the right fit for you. 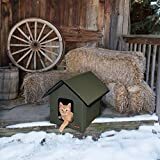 There are a large number of pet owners really happy with this outdoor insulated cat house, many claiming it stands up to wind, rain, and snow, though there are also pet owners who say that, while it’s a good cat house, it’s not amazing if you’re trying to use it in an uncovered area and want it to withstand rain, snow, and ice. Many, many pet owners do seem to love it for keeping on porches, so if that’s where you wanted your insulated pet house to go, definitely a viable option. 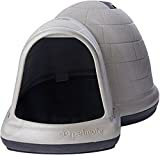 If you love Petmate’s Igloo Style Kitty Cat Condo, but want something bigger to house multiple outdoor cats, you may want to try grabbing their intended-for-dogs medium Indigo igloo. Just like the small, single cat insulated house, this one can be retrofitted with a quilted pad, plastic door flap, and yet again, K&H makes the perfect sized electrically heated pad to fit. I don’t think I’ve ever seen such a modern, sleek cat house in my life. This square, box-shaped outdoor insulated cat house looks even more minimalist than my IKEA furniture! One of the few pretty cat houses that is simultaneously modern looking rather than traditional or just plain cutesy like the Igloo style ones. Apparently, it works really well in bad weather, though if you’re interested in buffing up the insulation, this reviewer’s tips are spot on: “Currently I have towel padding on the floor and I’ve put an electric cat heating pad on top of that. Then I have 2 baby blankets curled around the interior for cuddling (not blocking the doors). In extreme weather, if I’m sure I have a cat in the house, I wrap a blanket around the non door parts of the house and some thick plastic sheeting for extra insulation and wind protection. I just secure it all with a couple of clothes pins. For a really bad snow storm I’ll put an open folding lawn chair in front of the door which acts like an awning, so they don’t get snowed in.” Genius! Unless you’re trying to house a large number of cats, I doubt you will need anything this big, but in case, like my old neighbour, you’ve got 5-6 cats who all happily go outside in the winter, but aren’t huge fans of snow, and you want to make sure they’ll be plenty safe and warm in case a sudden storm blows up while you’re not at home, one of these should really do the trick. Again, you have to buy the insulation kits separately, but they’re made to fit and look like they do a really good job at insulating. 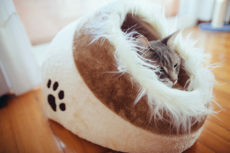 I’d still add a few blankets, and since the size of this one is so large, probably more than one cat bed as well, but once it’s all done up, I can’t imagine a cozier place for a few kitties to wait out a storm than one of these. One pet parent had the genius idea to place an outdoor insulated cat house just under her steps to keep a stray she’s been feeding for a couple years warm and safe, I expect during winter months. A lot of cats really seem to love this insulated cat house, and like many of the other triangle shaped roofed houses, cats really do seem to enjoy sitting both in and on top of this one. 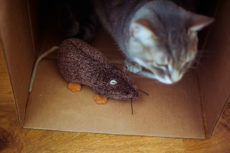 One reviewer posted the sweetest story about how her poor elderly cat who’s gone blind used to wander around distressed until the introduction of this cat house: “This cat house has seemed to calm her down quite a bit by giving her a small space where she can hide from the unknown outside world (including my other two cats, whom she despises). The fact that it’s a pretty small (and very cozy) space, seems to comfort her because she knows every inch of the space without having to explore it.” Love it when cats’ lives are made so much better by the things we get for them. 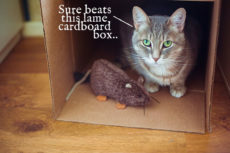 If you’re willing to drop a bit extra on an insulated cat house, and like me, you prefer to buy long-lasting options that are made of wood (so they can easily be cleaned, stained, sanded down, nailed into, or whatever else you might like), you may want to try out one of CozyCatFurniture’s products. They are waterproof, insulated, and again, due to the fact that they’re made of wood, incredibly easy to build on top of in terms of DIY-ing additional insulation and weatherproofing with human house materials, like asphalt shingles. 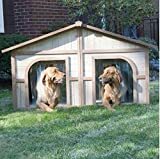 Extra Large Solid Wood Dog Houses - Suits Two Dogs Or 1 Large Breeds. This Spacious Large Dog Kennel Has Two Doors And Can Be Partitioned For Two Dogs. Large Outdoor Dog Bed Has A Raised Bottom and Natural Insulation. Your Perfect Large Dog Bed. 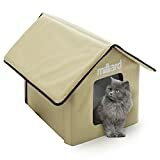 I know, it’s really, really big, but I think it’d be a killer option for those with multiple cats who want something made of wood and really well insulated and weatherproof. I again feel like it’d be really good because it’s made out of wood and thus should be very easy to DIY extra weatherproofing and waterproofing features. 100% the type of buy that’s meant to last a lifetime. A very pretty alternative in case you’re looking for something similar yet a little smaller: Antique Large Dog House W Roof Solid Wood Penthouse Kennels Crates Duplex. Your Thoughts on Insulated Outdoor Cat Houses? 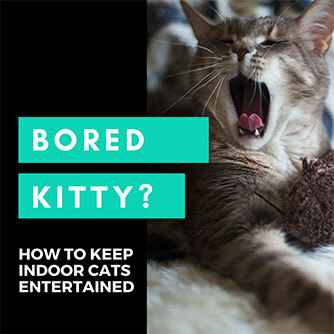 What do you think of insulated cat houses vs ones that are heated? Would you buy one over the other? 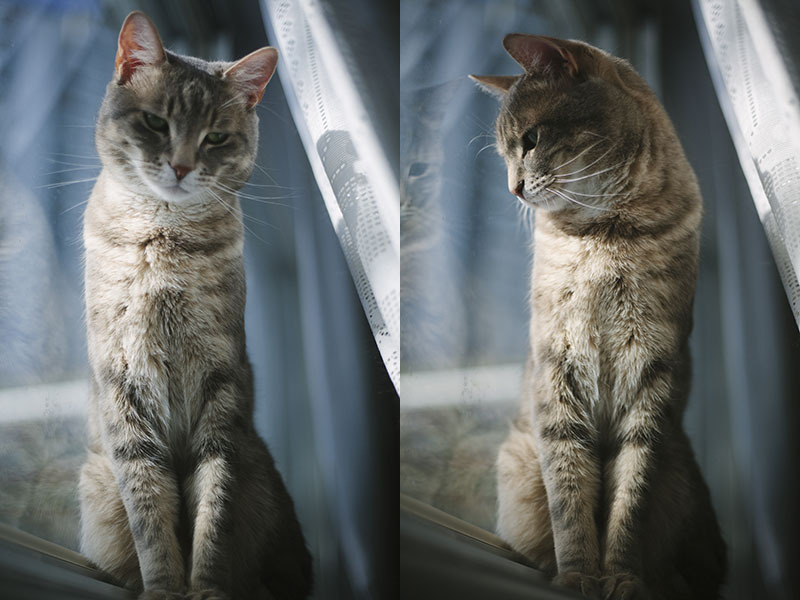 Which situations would you prefer insulated cat houses over ones that are electronically heated? Is there a type of insulated cat house you feel is better than others? Do you prioritize longevity, durability, the ability to DIY on top of a product? Do you prefer products that come with a lot of extra “add on” options? Do you like the idea of multiple smaller cat houses for multiple cats or one bigger one so they can share heat? Any advice, tips, or thoughts on insulated cat houses, please leave in the comments down below! Really curious to see what you guys think in terms of what works best for different types of situations. 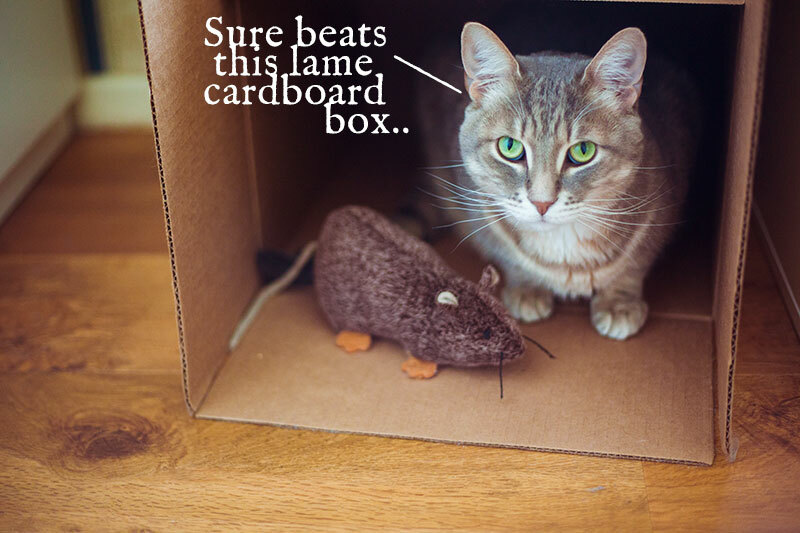 Too Cute: Cardboard Cat Houses Shaped like Castles, Cars, & More! I keep seeing references to people using towels and blankets. Please know that this is not the best insulation material for keeping kitties warm and dry. Blankets and towels get wet and freeze. Straw, if it does get wet, dries out. It is the best bedding to keep cats warm and dry. I think it’s fine if you keep an eye on the location after it rains to make sure it never gets wet. Some spots really just never get moist, no matter how much of a storm blows up, and if you’re putting a house in those places, I think it’s perfectly fine to have towels or blankets. If it’s in a spot that gets wet, definitely straw is the best bedding to use – hands down. So nice to see how, what others do to care for their outdoor kitties. I have the cutest, now semi feral kitten I have cared for since August of last year. I can pet him, pick him up, play with him. I even allowed him to come in for short periods of time to get use to house. My husband is just now getting accustomed to idea of having cat around and bringing him indoors. I brought one of the large, dense styrofoam containers from work. These things are wonderful. I cut the 6 x 6 whole on either side, heated the knife blade and sealed the openings’ edges and turned it so lid is on the bottom. The groove makes a snug, almost waterproof fit. I think next time I do this I will leave lid at top to easier take off for adjustments. I originally had a couple of blankets in it with self warming pads but the blankets always felt cold. The self warming pads are nice. I purchased several from chewy. I found a small sleeping bag and put in there. It works well and I love to peek in and see him looking cozy. I covered it with a mylar blanket and tarp to create a break from wind, rain and several garden pavers to weight it down. It’s been very cold here in mid Atlantic and I worry about him but I am going to try to help this little guy become an indoor cat if he allows it. He sounds incredible! 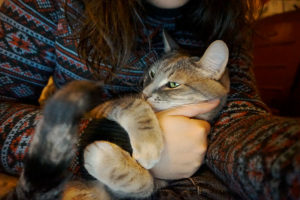 Quite a way you got with him if he’s already letting you pet him and pick him up, and even comes in the house sometimes. That’s an amazing set up – sounds ever so warm to me! Wishing you the best of luck with converting him to an indoor cat if he allows it. With any luck you’ll manage to do it before the next winter hits. So this little boy is a indoor friend for now. I had him neutered, purchased a nice playpen for him to recover in and now the pen is his bedroom for now, at least until he is more accustomed to other parts of house. We need to be able to trust him in house when we are not there. He does really well and we are proud of him. It is difficult at times when he begs to go out. We will try to work on screening back deck for catio! Any suggestions?! 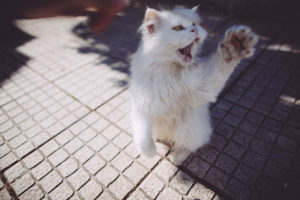 I do appreciate you, these discussions help with care for our feline friends! Catios I still need to look into; haven’t got the first clue about them yet! Truth be told, I’m terrible at DIY and always assumed they’d be tricky to put up with my non-existent DIY skills! Let me know if you make one – would love to hear what you did and how he likes it! 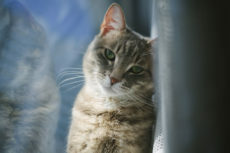 Happy to help with as many discussions started on caring for our feline friends as physically possible! Always try to put out the same kinds of posts I’d find helpful if I were to need something myself. I live in Missouri where it gets pretty cold! I built a house and put a hot light in it. Places it right next to the front door. The ferals that I help feed use it. If they don’t notice me at first they fly out of it! Otherwise they do pretty good with me walking up on them. But it also depends on how cold it is. It’s air tight but not insulated. There’s a window so they can see danger. They don’t trust me so they need to feel safe and have an out if they feel threatened. On the really cold days I have been able to touch a few of them. But the rest stay away until I am gone. No matter the time of year they need waterproof shelters. No one wants to get soaked. Especially bad in the winter! It’s awesome to see so many people caring for ferals in their area! Totally agree on the waterproof shelters, unless you have a really nice sheltered area already, and you’re just going to place a further insulated cat house in there. I have a spot like that, under stairs, so I wouldn’t mind a not-too-waterproof house going under there since no water gets down there regardless. So interesting what you’re doing for the ferals in your neighbourhood! I feel like if I had cat houses right next to my front door there’s no way the ferals in my neighbourhood would use them. They’re taken excellent care of by others on the street, which is amazing, but they don’t like to be petted or really get too near to humans nonetheless. Fine by me, so long as they’re safe 😉 And if I want a cuddle, I have my little house cat indoors. I built a wood cat house similar to Ecoflex square style for nothing. It was this heavy duty wood crate that had tiles shipped in it to where I worked and I took it home and cut a door in it and carpeted the interior floor and walls with new remnants. It came with wood legs so it’s up off our back deck. The wood top lifts off for cleaning and I got an electrical cat pad which is safe to use with the extra blanket I put inside. Felt square door flap bubble wrap all around outside this year. Last year covered it with plastic sheets. The only cost was the kitty heated pad. It’s so homely it’s cute. Cheers from cold, windy freezing Baltimore Maryland! I’m so jealous of you DIY-abled people! Your end result sounds so ridiculously amazing! I firmly believe that any cat house for the outdoors needs to be insulated. Should you have a power failure and not on solar then the cat can suffer greatly without the insulation and waking to a frozen cat is not good knowing that the cat suffered when it may have survived with just the insulation without the heat. With a powered system I would also worry about a lightning strike that could follow the power cord into their enclosure. Yes, these may be extreme cases but never the less a reason to be cautious about what we do to protect these small animals that we love so dearly that never fail to bring joy to our lives. I know that you can put surge protection on the power end of it but that is only good up to a point and does not cover power outages for long periods. 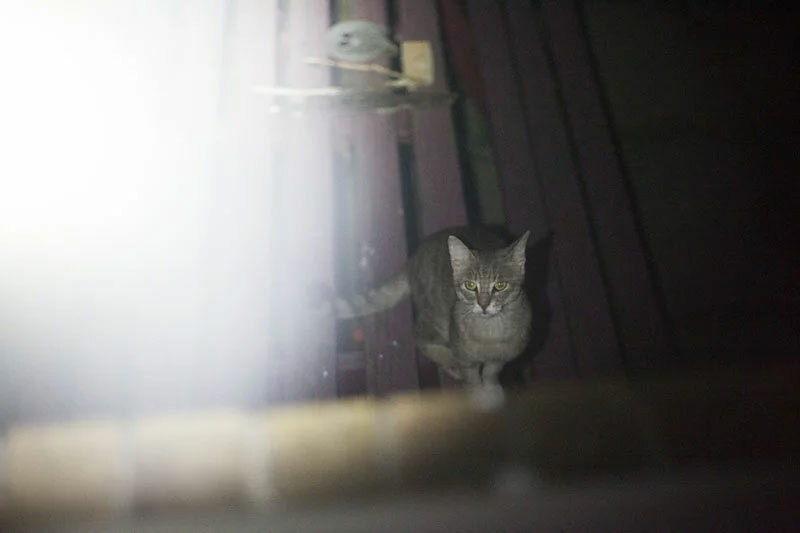 I have given this much thought as I took care of about 20 feral cats for a number of years until some person did not want them around anymore at my work place, then the rats came back. With a little imagination and ingenuity you can build one for the same price it can be bought already made and with a lot more attention to details with better results in most cases. The sense of satisfaction watching an abused cat claim a new safe haven gives you rewards that money can not. Thank you for giving me the opportunity to voice my opinion and concerns as it gives me a point to build my next cat play house outside for my cats (3) exercise during the stormy winter months knowing that they will be protected from the elements as well as other predators. I never thought about lightening strikes, that’s a good point. Your idea of using surge protection for electronic heated beds and houses should help with that enormously. Definitely agree that in one way or another, if you’re grabbing a cat shelter to keep a cat warm rather than just dry, insulation is a necessity. You don’t have to buy an insulated cat house, or a cat house at all – as you said, you can DIY one really easily if you have the skill. Or you can buy a bare bones pet house and add some insulation yourself. If you get an electric heated one without the insulation that’s also fine, but I completely agree that you should still try to add insulation in case there’s an emergency. So important to be prepared for the worst. It’s really easy to throw towels or bedding on the bottom of a cat shelter; even taping cardboard onto the sides and roof of the cat house will help enormously. There are emergency thermal mylar blankets that can be taped on top of the extra insulation to reflect a cat’s heat back on itself and those cost so little as well. 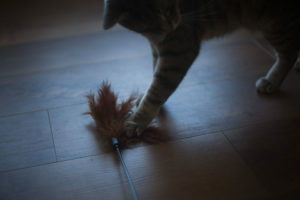 So many measures you can take preemptively, and for little to no cost of time, money, or effort, and for measures that could be the difference between life or death for a cat if there’s a power outage – wholeheartedly agree with your assessment, you should definitely insulate even if you go electric heated.